After hearing three days of oral arguments, the U.S. Supreme Court has now voted on the constitutionality of the Patient Protection and Affordable Health Care Act. While we wait to hear the court's decision in June, small-business owners might want to consider the potential effects. If the law is declared unconstitutional, the coverage provided by many insurance plans will undoubtedly change. For instance, the new law eliminates lifetime limits on coverage, and it allows parents to continue to cover their children until they reach age 26. It also keeps people from being denied health-care coverage because of preexisting conditions. Should the law be struck down, some insurers might eliminate these and other provisions. But exactly which coverage goes away and which stays will likely vary, depending on a small-business owner's particular insurance plan. At a more macro level, several important aspects of employee health-care coverage will remain the same even if the law is struck down. The number of small companies that provide health insurance to employees is unlikely to change much, health-care costs will continue to rise, and businesses will continue to require employees to pay for a greater share of their coverage. Moreover, uncertainty about the future of employer-provided health insurance will persist. While some pundits have claimed that the number of small businesses providing insurance to their employees will drop if the law is struck down, that seems unlikely. True, the tax credits designed to encourage small businesses to provide coverage would go away, but few companies have been taking advantage of those credits. The Kaiser Family Foundation found that only one-third of businesses with fewer than 50 employees have even determined whether they are eligible for the tax credit, let alone actually taken advantage of it. In fact, it seems likely that fewer small businesses would drop health insurance if the law were struck down than if it were upheld. That's because many small businesses have an incentive to stop providing insurance under the law. The tax penalties small businesses would pay for failing to offer coverage are less than the cost of insuring employees. But even this effect would be limited because the number of small businesses likely to drop coverage under the new law is modest. A survey by Fidelity Investments, for instance, found that 22 percent of small-business owners planned to discontinue coverage in response to the law. Separate studies by the human-resource consulting firms Mercer and Towers Watson found that 8 percent and 9 percent of companies, respectively, were likely to drop health insurance under the new law. 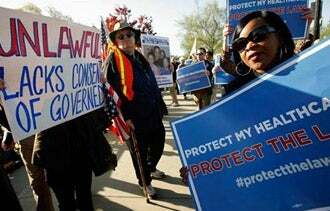 Health-care costs are unlikely to rise if the law is struck down. The law actually is expected to lead to a slight rise in costs. An analysis by researchers at the Centers for Medicare and Medicaid Services showed that the new law would increase U.S. spending on health care by 0.2 percent per year and result in health-care accounting for an additional 0.3 percent of gross domestic product in 2019. To cope with rising health-care and insurance costs, companies have been passing a higher share of the premiums on to their employees. Regardless of what the Supreme Court decides, that trend is likely to continue. And even the general uncertainty about the future of employee health insurance is unlikely to diminish if the court fails to uphold the law. Although the primary source of uncertainty right now -- the question of the constitutionality of the law -- will be resolved, the Supreme Court's decision likely will cause Congress to revisit the issue. That, of course, means small-business owners would face a new uncertainty -- how Congress will shape the future of employee health insurance in light of the court's ruling.